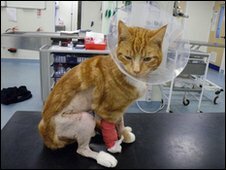 A cat has suffered "appalling" injuries after being shot by an air rifle at close range in north Cornwall. Felicity Cross, animal welfare officer for the Royal Society for the Prevention of Cruelty to Animals (RSPCA), said: "This is a horrific incident where a cat has suffered appalling injuries. "He is a lovely animal and although he isn't out of the woods yet, we are all hopeful he will make a full recovery. "We are liaising with local police. I would appeal to anyone with information to please contact me, or the police, if they have heard or witnessed anything."